In this paper, we aimed to investigate how individual differences and contextual factors predict coping styles and wellbeing of Syrian refugees. For individual differences, we scrutinised self-regulatory preferences (i.e. regulatory focus; promotion vs prevention). In order to investigate contextual factors, we compared refugee samples from two countries (i.e. Turkey and Germany) that differ from each other in terms of various factors, such as the total number of refugees in the country and distance to the conflict zone. We collected data from 273 individuals in Turkey and 169 individuals in Germany. We examined how problem vs prevention focus both directly and through the mediation of coping styles (i.e. problem-focused, emotion-focused, and maladaptive coping) predicted levels of wellbeing (i.e. anxiety and depression) in these two samples. We also checked for the moderating role of contextual factors via country differences. The current Syrian-refugee emergency requires critical research to design more effective interventions. Yet, not many studies on refugee wellbeing shed light on how individual differences and coping strategies may be effective or ineffective to improve mental health outcomes, especially in precarious conditions such as the ones refugees live in. Even the same refugee groups from different places may show unique characteristics because of contextual differences as well as the differences in person-context interactions. Before going further on our paper, it is important to understand how we approached these issues in our research. Coping styles. When confronted with a stressor, those who adopt problem-focused coping style directly deals with the stressor to remove it (e.g. seeking instrumental social support) whereas those who embrace emotion-focused coping style deals with the emotions caused by the stressor to remove negative feelings (e.g. positive reinterpretation). On the other hand, those who engage in maladaptive coping style simply ignore the stressor as well as the negative feelings associated with it, using strategies such as denial or behavioural disengagement. There is a paucity in research examining coping styles of refugees in relation to their wellbeing and it seems of great importance to identify the most useful coping strategies for refugees to design better interventions for them. Regulatory focus. How people tend to approach different problems is also relevant for what coping strategies they would choose to cope with these problems. When promotion focus is adopted, people act based on the existence or absence of positive outcomes by focusing on gains and accomplishments. On the other hand, when prevention focus is adopted, they act based on the existence or absence of negative outcomes by focusing on losses and obligations. So, people compare their situations with a better reality in promotion focus whereas they compare their situations with a worse reality in prevention focus. Regulatory focus has not been studied in a refugee sample before and understanding self-regulatory preferences of refugees would help us to comprehend their thinking styles in such unique situations. Wellbeing. Traumatic events such as civil war and forced migration can have various effects on the mental health of the survivors. Anxiety and depression may be considered some of the common mental health problems that are reported by such individuals and therefore, we looked at these two problems in our sample to understand wellbeing among refugees. Context. Our samples from Turkey and Germany cannot be treated as representative. However, there are some basic differences that makes these two countries distinct from each other. Turkey has the largest number of Syrian refugees in the world whereas Germany has the largest number of Syrian refugees in Europe. In both countries, Syrian refugees may live in different conditions, encounter different problems, be supported with various sources, etc. However, Syrian refugees have a much greater proximity to the conflict zone in Turkey, witnessing direct and indirect consequences of the conflict whereas those in Germany witness no direct consequences of conflict. Although not tested directly in our research, such factors may help to explain our results and offer some implications on the significance of context. Syrian refugees in Turkey had higher levels of anxiety and depression than those in Germany. Moreover, their levels of wellbeing (i.e. anxiety and depression) were above the clinical cut-off point. This signifies that urgent interventions are needed, especially in proximal contexts to the conflict zone. Compared to Syrian refugees in Germany, those in Turkey employed more maladaptive coping strategy, and less problem-focused and emotion-focused coping strategies. 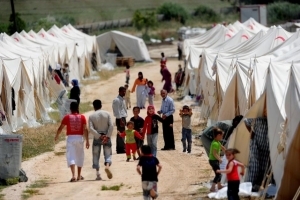 Yet, problem-focused coping was detrimental to wellbeing among Syrian refugees in Turkey. It had also no effect on the wellbeing of those in Germany. In addition, maladaptive coping negatively predicted wellbeing in both samples. All of these indicate that interventions that are designed to improve wellbeing should not only focus on mental health but also on coping strategies. Perhaps the most useful finding of our research suggest that urgent interventions should aim to reduce maladaptive coping among refugees. Moreover, our research shows that problem-focused can be maladaptive in certain conditions. Maybe this was because of refugees’ lack of control over their situations. So, it seems extremely substantial to identify which coping strategies should be encouraged in such conditions to produce the best mental health outcomes. Syrian refugees in Germany had a stronger promotion focus compared to those in Turkey but still, promotion focus was identified as a resilience factor for both samples. Therefore, new interventions can be designed with the purpose of endorsing promotion focus among refugees, which would then improve the resilience of this group to deal with the stressors in their surroundings. All in all, most of the research on Syrian refugees focused on their wellbeing but only a few studies have investigated resilience and coping in refugee samples. Thus, our paper is one of the limited contributions to this topic. In this paper, we scrutinised regulatory focus as a proxy for individual differences and looked at its relations to coping and wellbeing, by also taking contextual factors into account with refugee samples from two countries. I hope that this research would inform stakeholders to design more effective interventions considering refugees’ individuals differences and specific conditions, and also encourage further research to take fresh perspectives into the study of refugee wellbeing. Nihan Albayrak is a PhD candidate in the Department of Psychological and Behavioural Science at the London School of Economics and Political Science. She specialises in identity, migration, and prosocial behaviour. Her PhD research on helping Syrian refugees has won the LSE Festival Research Competition Popular Prize in 2018. ***The paper is open access and accessible here.